For this month's style steal I thought I'd have a go at stealing an outfit I recently saw on Kylie Minogue. But don't panic ladies I can promise you that there's no hot pants or feathers in sight as I don't know about you, but after the recent over indulgences from Christmas (or any time in fact!) I'm not about to declare it hot pant season.....phew! But this outfit I love & as soon as I saw it knew it would make a great style steal. Plus whilst I don't own or trust myself with a cream coat (yup I would be the one who would mark it within 5 minutes of it's first wear) it's a look that most of us could probably re-create to a certain degree with pieces already hanging in our wardrobe. So first off here's the ever ageless Ms Minogue rocking winter whites & a statement tee. 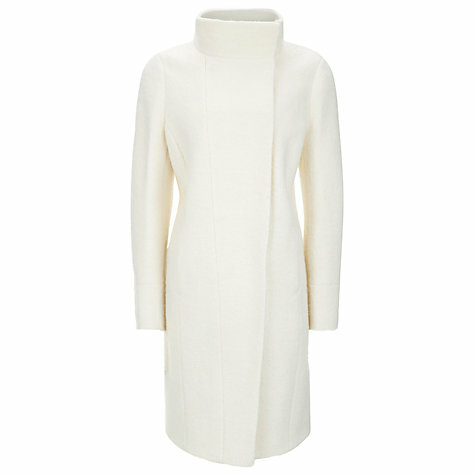 And here's how I'd recreate the look with picks from the high street, starting with this timeless & gorgeous funnel neck off white coat. Such a classic & stylish style that will never date. I really think this style is perfect when you're wanting to create an effortlessly chic outfit & can so easily be dressed up as much as it can dressed down worn undone with distressed boyfriend jeans & trainers. 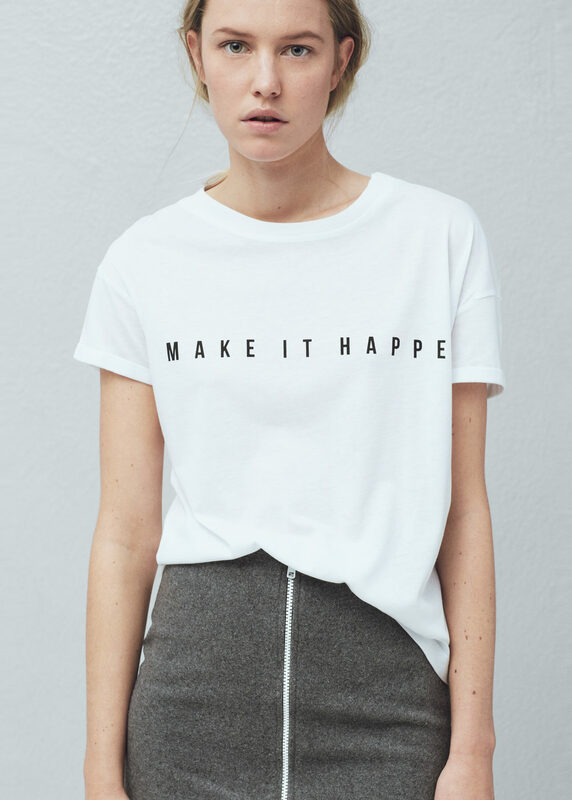 Onto the slogan t-shirt next & this one from Mango is a great price if you like the idea of this style of top but aren't sure how much you're going to wear it. 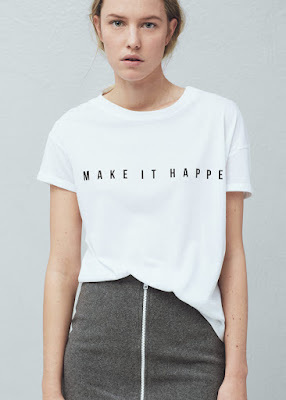 I find the couple of t-shirts/jumpers I have similar to this perfect for dressing down a smarter look & love teaming under a blazer or tuxedo jacket for a smart glam look as much as I do in the warmer months simply flinging on with boyfriend jeans & trainers. 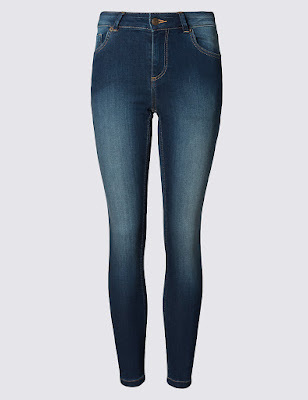 Classic skinny washed denim jeans from Marks & Spencer to finish this look & these look the perfect shade of denim if you're on the look out for a new pair. Plus they're available in three different lengths. 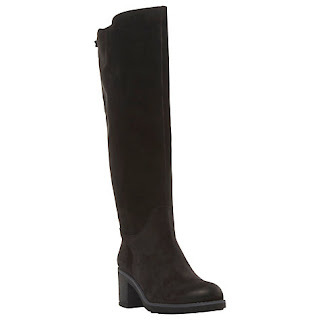 And to finish the look knee high boots. I've chosen this pair as they have a sensible heel - still tall enough to add some height but sturdy enough to be worn when dashing here there & everywhere. As I said earlier I don't have a winter white coat so here's my interpretation of Kylie's look using pieces already in my wardrobe. So ladies what to you think, is this a look you could have a go styling with similar pieces in your wardrobe & what do you think about a slogan/statement tee - are you a lover or a hater?! As always I'd love to hear your thoughts.